Recently I setup a UserVoice Feedback and Help Desktop account for one of my software products. 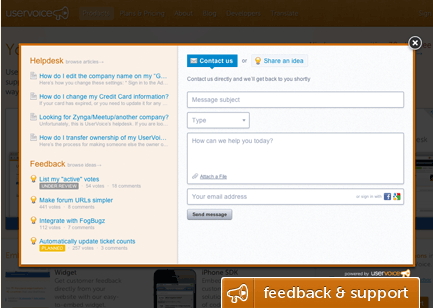 This is a fantastic service that allows your users to submit feedback and improvement suggestions on your product. Your users can then rate the importance of the feedback and you get to interact with them by accepting it, etc. They have different plans to choose from and also offer a completely free plan that you can get started with in seconds. They also offer a feedback widget which you can easily add to your website, which allows your users to submit feedback directly from your website without having to leave your site or login to another system. Your users can then start submitting feedback and as they type, matching content will be displayed so they can see what’s already submitting and won’t submit something that already exists. If you’re interested in your users feedback and ideas to improve your products, then you should consider using UserVoice’s Feedback Management Software.